If you work in an office, it's quite hard to run away from Microsoft Excel. 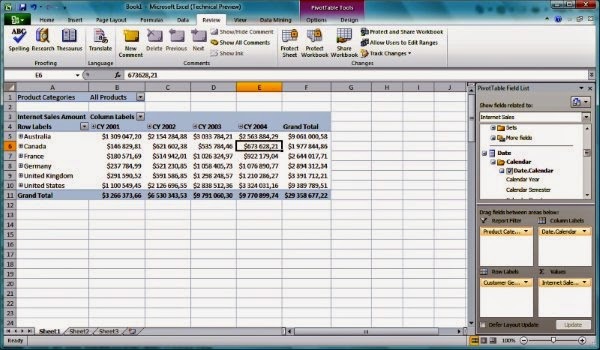 Whether you're tracking costs in Finance, putting together a marketing plan or maintaining a list of sales contacts, chances are you'll be using Excel to do these tasks. So to help you go home on time, here are 19 of the most useful Excel shortcuts. CTRL+ARROW KEY Moves to the edge of the current data region in a worksheet. Useful if you want to reach the last row or column of a worksheet. SHIFT+ARROW KEY Extends the selection of cells by one cell. Use it to select multiple cells in a small region at a time. CTRL+SHIFT+ARROW KEY Extends the selection of cells to the last nonblank cell in the same column or row as the active cell, or if the next cell is blank, extends the selection to the next nonblank cell. Use it to select a row or column of cells within a longer row/column. CTRL+PgUp Switches between worksheet tabs, from left-to-right. CTRL+PgDn Switches between worksheet tabs, from right-to-left. CTRL+V Pastes the copied/cut cells including formatting. ALT + E + S + V Paste values only. ALT + E + S + T Paste formats only. One fast way to get rid of formulas is to use a ALT + E + S + V followed by an ALT + E + S + T combo. CTRL+SHIFT+$ Applies the currency format to 2 d.p. While these may seem like only short time savers, because we spend so much time on Excel, the little things add up. It may seem daunting to learn so many shortcuts at once. Well... don't! It is better to start incorporating three to five per day. With experience, you'll get more confident and can incorporate even more new short cuts. Thanks for sharing this excel shortcuts.It is really useful.Continue sharing more like this. Glad you found it useful, Jhon. Look out for more tips soon!